Summertime, and the living is easy. Travel makeup should be easy too. I only use four basic makeup items when I travel in the summer. The light makeup gives a European look, with a focus on skin and eyes. This is also compatible with the outdoor activities I enjoy so much. In addition to my four basic makeup items, I will also bring along a darker lip pencil, a multi-color eye shadow, and an eye liner crayon. I’ll use these for evenings out. Tinted Moisturizer – Who likes a heavy foundation when it is hot outside? Powder cakes up with sweat. My tinted moisturizer from Aveeno is rated at SPF30. That makes it a 3-in-1 product – foundation, moisturizer, and sun screen. It provides a very light cover and evens out your skin tone without soaking into your pores. I decant the moisturizer into a smaller bottle for my trips. I find that 1.5 fluid ounces (around 45 ml) is plenty for a 2 week trip. Mascara – This is a necessity for those of us with blonde or blonde tipped eyelashes. I usually choose a waterproof mascara because I take part in sweaty activities. There’s nothing more embarrassing than raccoon eyes! Waterproof mascara is also a good choice if you participate in any water sports. I remove the mascara using TSA compliant cotton balls soaked in olive oil. One soaked cotton ball is sufficient for both eyes – use one side for each eye. NARS multi-stick – NARS multi-sticks are expensive. I think they are worth every penny. The color goes on smoothly when applied with the fingers. Build the color up by applying multiple layers. A light application gives a very natural daytime look, while several layers give an evening look. I use my multi-stick for highlighting / blush / eye shadow. I also use it as a base on my eyes for my evening eye shadow powder. Lip Stain – I find that lip stain lasts a little longer for me, especially if I am sweating a lot. My stain balm from Revlon comes in a crayon and is TSA compliant. The mascara and moisturizer are the only makeup items that need to go in my liquids bag. All of the other items (including the olive oil cotton balls) are solids. They fit in a very small makeup bag in my purse. There’s no need to bring all those lotions and brushes on vacation. Travel lightly by using simple multi-use products. How about you? 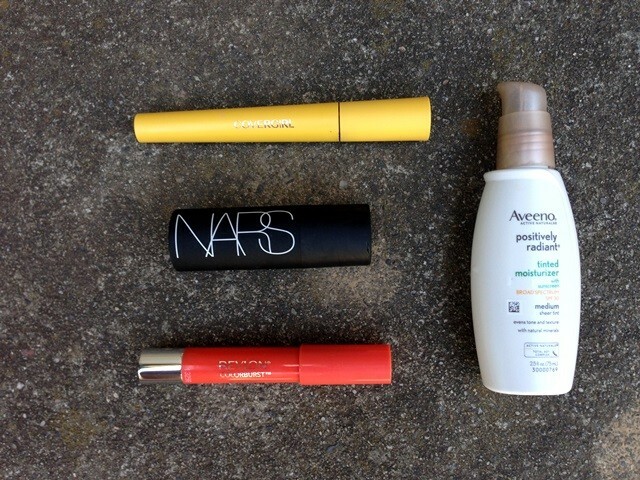 Do you minimize your makeup for summer travel? I’m pretty pale so a touch of color helps quite a bit. When you use the tinted moisturizer from Aveeno, do u find the need to set it with powder? What kind of finish does it give? It has a glistening look about it. It is definitely not a matte look. I absolutely love the Aveeno! I’ve been using it for ages now and besides having sunscreen it gives your fresh a fresh even tone . Great tips. I use petroleum jelly to take off mascara and a small tub doesn’t take up much space, but I like the idea of cotton balls. As far as I know there are no FDA approved dyes for brows or lashes. A misapplication could permanently mess with your vision! If you are going to do it then make sure your technician knows what they are doing. I press as many cotton disks into a small round Tupperware as possible and absolutely soak them in micellar oil infused water. It’s amazing how many discs can be pressed in and fully soaked. These are fab for makeup removal. With the right packing, these discs can last up to two weeks. The same thing can be done for nail polish remover. Extremely small toothpaste tubes (18ml) can be obtains in pharmacies or dentists. Recyclable charcoal infused bamboo toothbrushes are incredibly light and earth friendly. All face/ hair products are decanted into regulation bpa free polythene containers and I use skin balm ( Elemis) as deep cleanser/ face mask, hair shine. I’m a mosquito’s idea of a banquet and so use E45 body lotion infused with essential oils, either lavender or citronella depending where I’m applying it. Citronella definitely around feet and ankles. Final thing. I always have my very frizz-prone hair professionally straightened before holidays. This saves on taking serums and straighteners.